Volt is powered by two electric motors that work in unison to optimize efficiency and conserve electric charge while providing responsive power and torque. 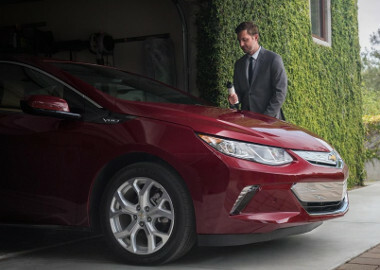 With a fully charged lithium-ion battery, Volt is capable of driving up to 53 miles without using gas. The Volt battery is both lighter and holds more energy than earlier volt batteries. When the battery runs low on electric charge, Volt seamlessly engages its gas-powered generator to keep you going for a total range of up to 420 miles on a full charge and full tank of gas. 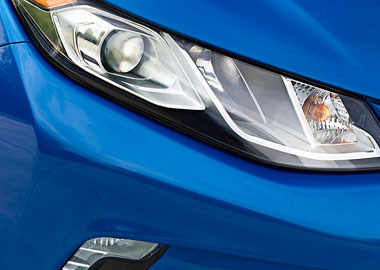 Volt provides ideal visibility with gorgeous, aerodynamically integrated LED low beam headlamps and taillamps. The upper and lower grilles give a striking appearance while active aero shutters help aerodynamic performance. Form meets function in Volt. It starts with a sleek and sporty redesign that elevates the first-generation design. And with two unique trim models and multiple color and wheel choices, it’s easy to create a Volt that matches your personality. The new Volt gives you more ways than ever to charge and monitor your battery. The innovative Power Flow screen helps you track your driving, while Regen on Demand™ seamlessly transfers the kinetic energy from the vehicle's motion and stores it in the battery while slowing the vehicle down, all with the press of a steering wheel-mounted paddle. The interior provides a refined driving experience, from intuitive driver displays to an available heated steering wheel. Volt offers available built-in 4G LTE Wi-Fi® connectivity through OnStar®. The powerful signal gives you and your passengers the ability to seamlessly connect up to seven devices to the Internet, giving you the freedom to roam while connected. The available Forward Collision Alert and low-speed Front Automatic Braking systems use camera technology to alert you to slowing vehicles in your path, and even automatically applies brakes to help reduce the collision's severity. When the air bags deploy, built-in sensors can automatically alert an OnStar Advisor, who is immediately connected to your Volt to see if you need help. Volt utilizes advanced high-strength steel throughout which reduces mass while increasing overall vehicle strength and integrity.